July 29, 2013  Over the past six weeks, Egypt's military has cracked down on the smuggling tunnels that bring many goods into Gaza. One official estimates that Gaza's GDP has lost $230 million and thousands of jobs over the past six weeks. 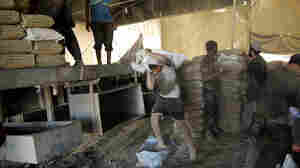 Israel tightly controls construction materials going into Gaza. July 26, 2013  There have been more mass protests in Cairo and other cities. 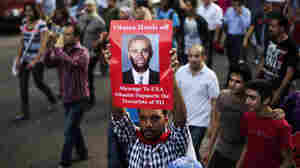 Analysts fear more violence amid expectations of a crackdown on Islamists by the army and police. July 25, 2013  Only a few days have passed since Secretary of State John Kerry announced that Israelis and Palestinians have laid the groundwork for a resumption of peace talks and that negotiators would convene in Washington in "the next week or so." 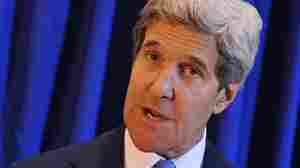 Kerry received praise from all corners for his hard work and diplomatic skills to at least get both sides back to the negotiating table. But a few cracks are already appearing in the plans, with both side laying out conditions before talks get underway. July 23, 2013  A recent survey found strong anti-American sentiment among leading aid recipients. In Egypt, Jordan, Pakistan and the Palestinian territories, 16 percent or less of the population had a positive impression of the U.S.
July 23, 2013  Renee Montagne talks with Aaron David Miller of the Middle East Program at the Woodrow Wilson Center about the prospect of renewed negotiations between the Israelis and Palestinians. July 20, 2013  The announcement comes hours after Secretary of State John Kerry said the two sides had agreed in principle to restart peace talks that collapsed five years ago. July 20, 2013  The move appears to be the beginnings of revived peace talks. 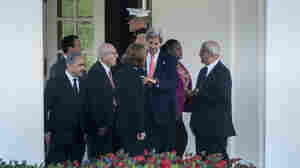 Secretary of State John Kerry announced Friday that there is enough agreement to begin initial talks as early as next week. July 19, 2013  The details have not been finalized, but the sides appear close to resuming full-fledged negotiations after years of stalemate.